The variable $selectedData is provided to the script automatically by SPE in context of the content of the results on Show-ListView. What input is passed to an action script? $allData – all objects passed to the list view using the -Data parameter. 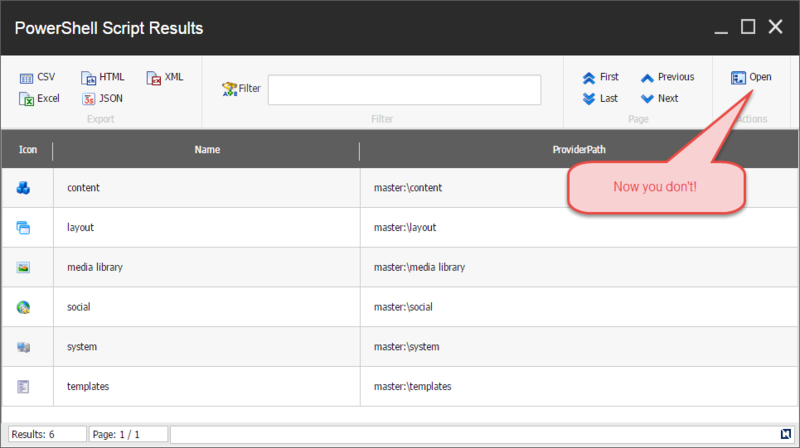 $filteredData – all objects displayed after filtering is performed with the search criteria entered by the user in the ribbon. $exportData – same as $filteredData, however in this case the objects will have additional properties to support easy display with properties processed as text. $actionData – any object that was passed to Show-ListView using the -ActionData parameter. Useful when you need additional context that the Show-ListView command does not explicitly know about. It’s your custom data. $formatProperty – the content of the –Property parameter when running the command. 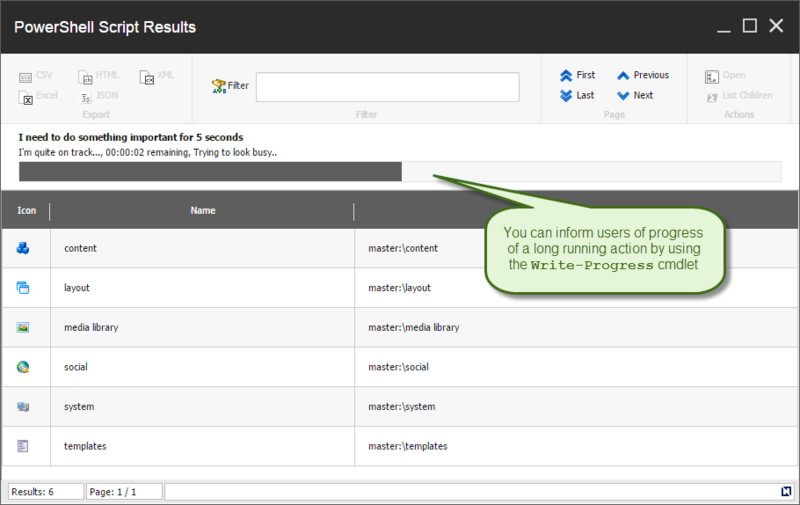 $title – window title of the list view. 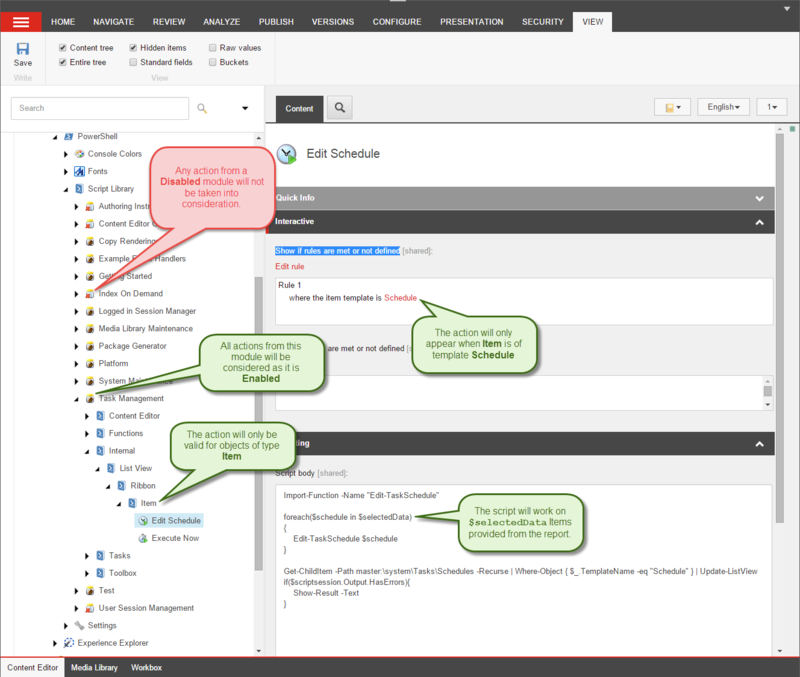 $infoTitle – info title of the list view. $infoDescription – info title of the list view. 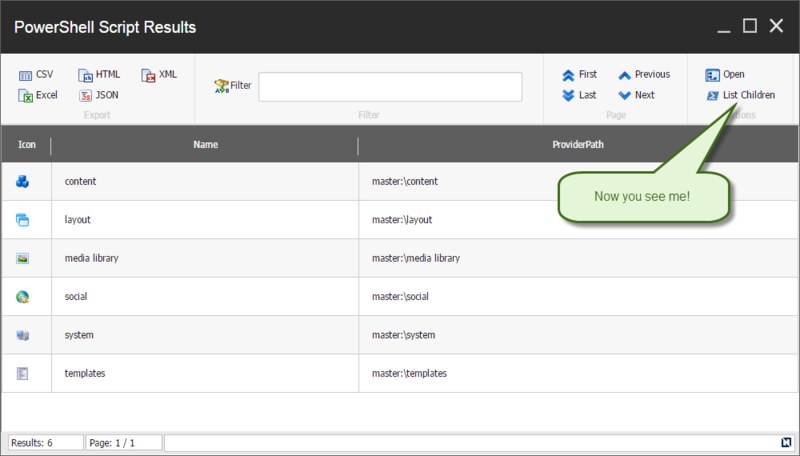 Consequently you get the full state of the report the user sees in the UI and you can act upon it. How the report determines if your action is visible? 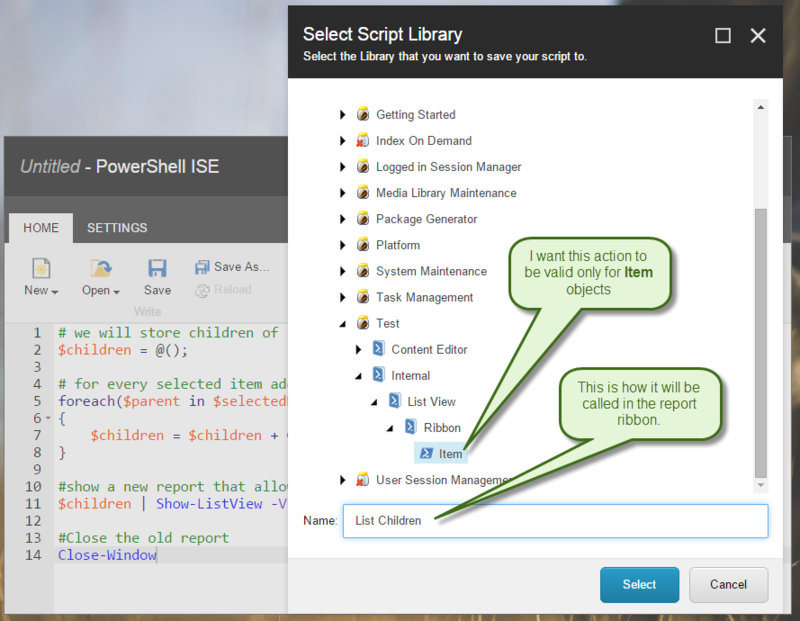 All scripts visible in the report should be located in an enabled module. 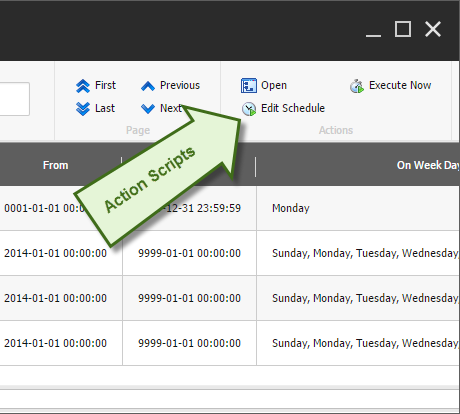 The action script should be within the path /Internal/List View/Ribbon/<Object type> . The <Object type> is the name of the .Net class for which the action is valid. 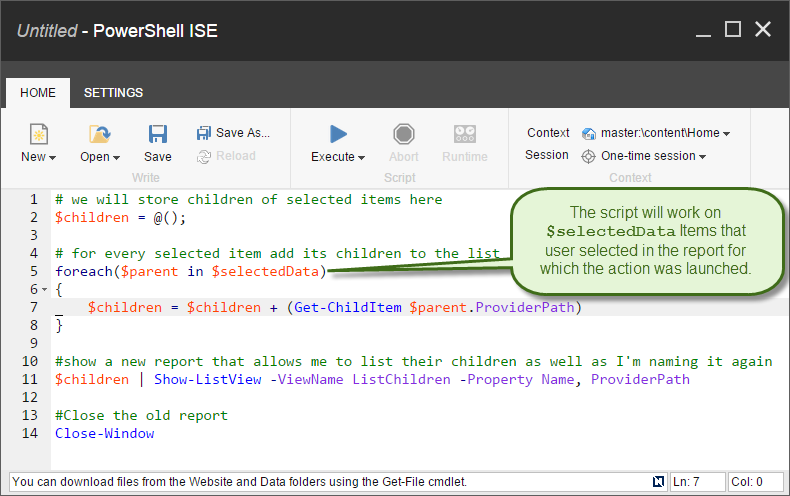 For example, if you want your action to be visible for Sitecore.Data.Items.Item then save the script at the path /Internal/List View/Ribbon/Item. If the action script has no rules defined in the “Show if rules are met or not defined” field it will appear for all objects passed to Show-ListView that are of the type based on location. Rules will provide more granular control and allow for rule-based conditions that determine action visibility. 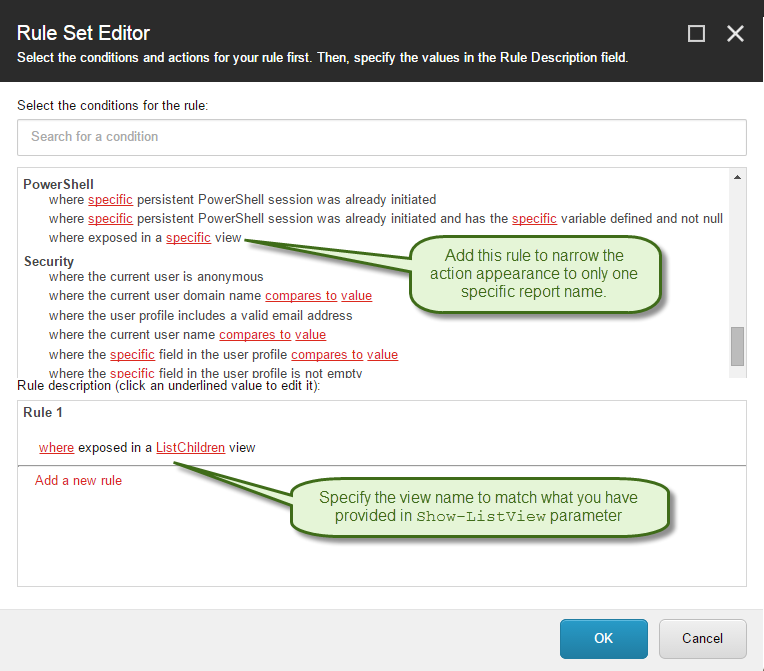 Rules add the full power of the Sitecore rules engine – similarly to what you can do on context menu items or ribbon actions in Content Editor like I’ve described in my previous post. Some examples where this can be useful include only enabling or disabling the action for items located under a specific branch of the tree or if a persistent session exists. The following screenshot shows how to create an action that only appears in reports that list objects of type Item that are of template Schedule. For specific reports this global state might not always be enough. You can narrow down the rules further by using the report name. Name your report by providing an additional parameter to your Show-List view in addition to what I described in my previous post about reports. The output of the report will be like any other unnamed report but adds support for additional rules. Let’s say I want my action to open a new report that lists all the children of the selected items in the report “ListChildren”. After running the action my script should display the new report with the children and close the “ListChildren” report. Not very useful but illustrates the point. At this point my action will show on all reports what list Item objects. But now that my script is saved I can modify its rules to narrow it down only to Show for reports named “ListChildren”. For this I can click the “Runtime” button in the ISE ribbon and edit the “Show if rules are met or not defined” field. Confirm the save on all dialogs to persist your changes. Now our action appears when we run this script in ISE. In this case we’re not closing the existing report but rather updating the list in place, all you need to do is send the new data to the Update-ListView command. The action runs fully asynchronously so you’re free to show any of the power of the provided commands. 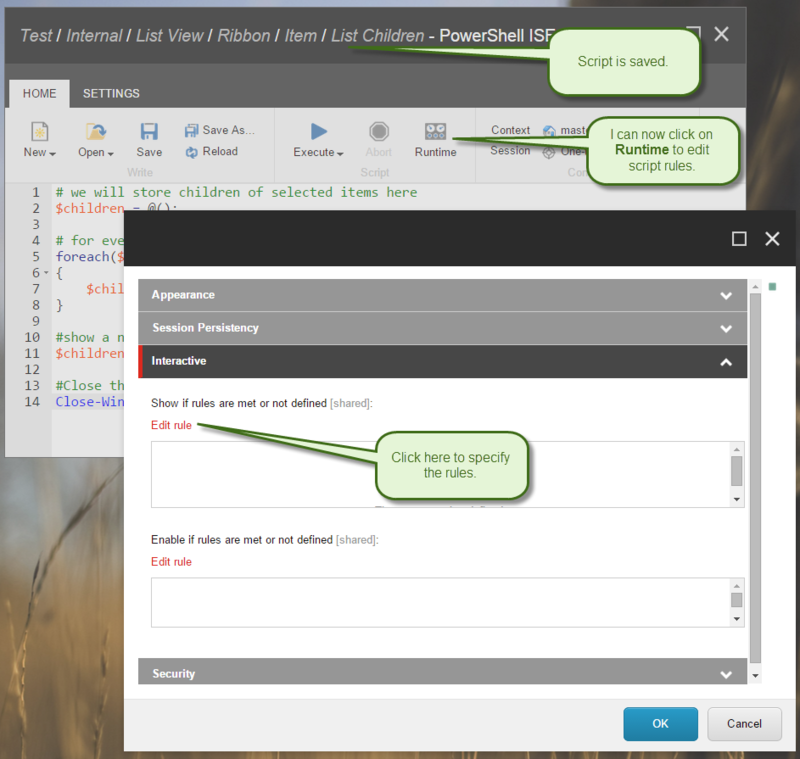 This means that you can ask for additional input using the Read-Variable command or Show alert using the Show-Alert command or do just about anything possible otherwise from the context menu, ribbon or other interactive integration points. The Show-ListView command has one more useful parameter named -ActionData which I mentioned above but is worth mentioning again. Anything passed using this parameter will be set as the $actionData variable – this means your report and actions can pass custom data in them it can be as simple as an object or as complex as a hashtable so there is really no hard limit on what can progress from a report to report. 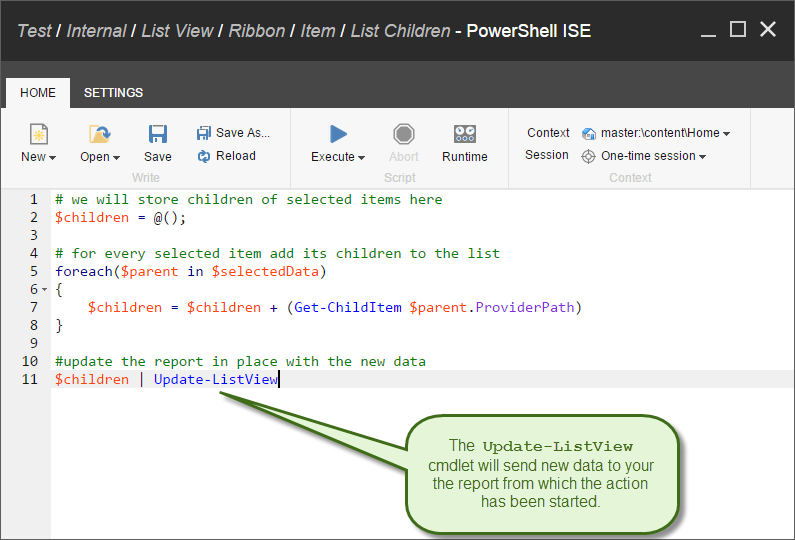 Any object that was passed to Show-ListView using the -ActionData parameter will be available to your action. The persistent session ID as described in my previous post will be respected and your script will run in that persistent session if it’s already in memory or create a persistent session if it’s not. Alternatively you can elect to simply freeze the session the initial script that generated report was running in and run actions in that same frozen session by using the -ActionsInSession parameter. I hope this blog post will help you deliver the best functionality your users expect from you. Happy scripting! This entry (Permalink) was posted on Tuesday, May 5th, 2015 at 10:00 am	and is filed under .Net Framework, PowerShell, Sitecore, Software, Software Development, Solution, Uncategorized, Web applications. You can follow any responses to this entry through the RSS 2.0 feed. 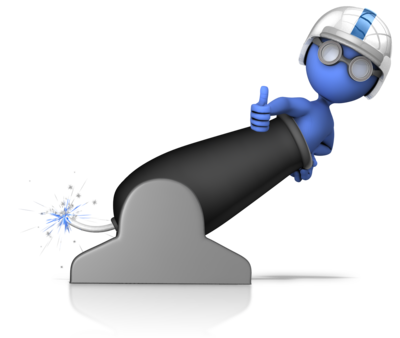 You can leave a response , or trackback from your own site.